Dispensing and Sampling Booth are designed to give mixed air flow stream for product, operator and environmental protection and used to control the hazardous emissions of dust powder during powder dispensing / sampling process. We are offering Sampling & Dispensing Booth. It is used to control hazardous emissions of powder, dust orvaporr during powder dispensing, drum tipping, product sampling, without risk to the operator or environment, and are available inthe wide modular range of sizes. They are constructed from stainless steel in fully ducted designs. 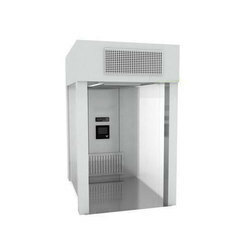 The reverse laminar flow booth is formed by a stainless steel; AISI 304 Matt finished self-supporting structure, provided with rounded corners for easy cleaning. 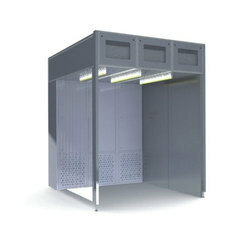 Filters: Aluminum framed High efficiency Particulate air (HEPA), Mini Plate with a minimum efficiency of 99.99% at 0.3 micron. Hepa Filter: Aluminum framed High efficiency Particulate air (HEPA) with a minimum efficiency of 99.99% at 0.3 micron. Pre filter: Washable type pleated 10 Micron pre-filter with 90% efficiency. EU4 rating. Motor / Blower assembly: Direct drive, continuous duty ¼ HP with sealed bearings. Motor assembly is mounted on M.S.casing to reduce noise vibration and is dynamically balanced. It is also known as Sampling or Dispensing Booth. It is used to control hazardous emissions of powder, dust or vapour during powder dispensing, drum tipping, product sampling, without risk to the operator or environment, and are available in wide modular range of sizes. The reverse laminar flow booth is formed by a stainless steel; AISI 304 Matt finished self-supporting structure, provided with rounde d corners for easy cleaning. Filters: Aluminum framed High efficiency Particulate air (HEPA),Mini Plate with a minimum efficiency of 99.99% at 0.3 micron. Motor / Blower assembly: Direct drive, continuous duty ¼ HP with sealed bearings. Motor assembly is mounted on M.S.casing to reduce noise & vibration and is dynamically balanced.